Definition at line 19 of file schtasks.c. Definition at line 136 of file schtasks.c. Definition at line 206 of file schtasks.c. Definition at line 298 of file schtasks.c. 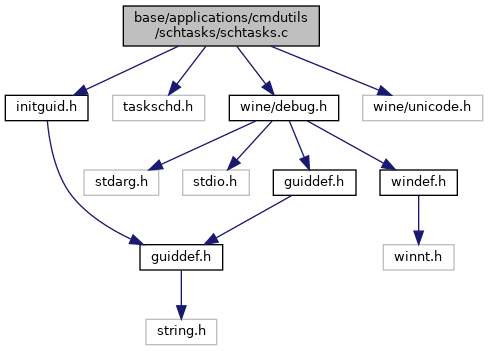 Definition at line 68 of file schtasks.c. Definition at line 39 of file schtasks.c. Referenced by create_command(), delete_command(), and get_registered_task(). Definition at line 91 of file schtasks.c. Definition at line 349 of file schtasks.c. Definition at line 29 of file schtasks.c. Definition at line 30 of file schtasks.c. Definition at line 31 of file schtasks.c. Definition at line 32 of file schtasks.c. Definition at line 33 of file schtasks.c. Referenced by create_command(), and delete_command(). Definition at line 34 of file schtasks.c. Definition at line 35 of file schtasks.c. Referenced by change_command(), create_command(), and delete_command(). Definition at line 36 of file schtasks.c. Definition at line 37 of file schtasks.c.